Here are six revealing minutes of Battlefront, showing action on Endor and Jakku. Hero characters feature prominently. Leia, Luke, Han Solo, Boba Fett, Darth Vader and the Emperor mix it up planetside as Slave-1 and the Millennium Falcon boss the skies. The heroes are excellent fan service, but I found they created an odd dynamic in the Battlefront beta. The power of Darth Vader's celebrity made me want to see his lightsaber-craft up close. The "oh hey it's that guy from the films!" instinct got me killed many times. 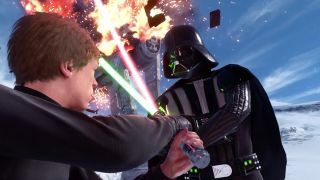 Battlefront feels more like a Star Wars theme park than a shooter, which is neat, in its own way. This video may well be taken down soon, but you can always tour the theme park yourself using the Battlefront "planets experience", or check out the latest official trailer set on Jakku.